Do you have Xenophobia? Does the thought of striking up conversation with the nearest person scare you to death? Or are you basically disinterested in everything they might say to you? Below are three reasons (among MANY) why you should open your mind, put your guard down and get talkin’ to the locals. 1. They know things you don’t: This should be obvious to you by now, but in case you didn’t know, that person over there knows something you don’t. Intriguing, eh? So hop to finding out what that thing might be. 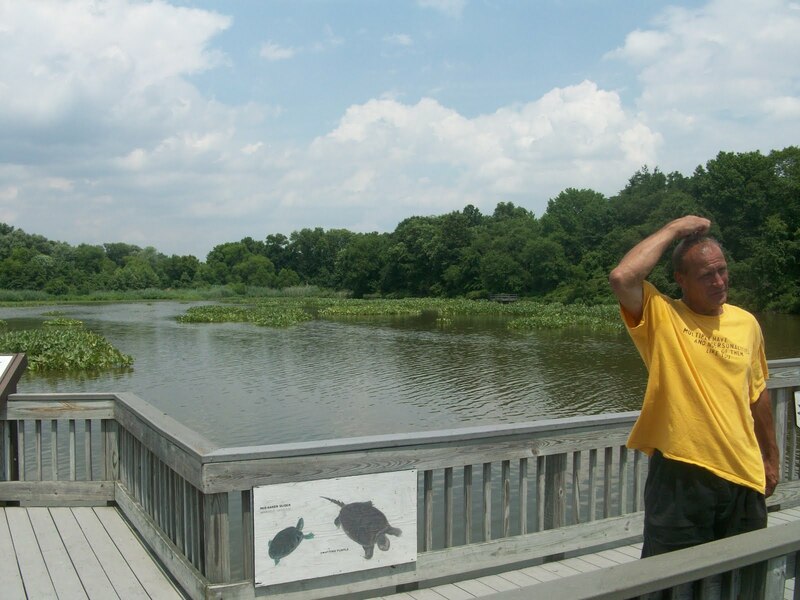 For instance, today while hiking at John Heinz National Wildlife Refuge, Bob, an elusive, yellow t-shirt wearing local chatted my ear off about his memories at the Wildlife Refuge, including what flowers were in season at what time of the year and to stay away from wild turkeys, because although they are cool to look at, they will attack you. Bob and I met up several times throughout the day, and when passing one another, we would smile warmly, make a quick joke, and he would direct me to an awesome point of interest not far away (Observation Deck). Bob was cool; it wasn’t his job to tell me about the flooding that destroyed part of the park years ago, his memories of fishing on the banks, or that there is a shitload of turtles all around, but he shared that with me anyway. It deepened my experience there. I was able to imagine Bob and his friends catching Crappie and then throwing them back while on my walk. Sounds silly, but someone’s story can really give your experience a different perspective. 2. Same time/same place syndrome: Ever been stuck in a long line at the bank, and somehow find yourself agreeing with the person in front of you that the line is taking forever? Makes you feel a little better, doesn’t it? Imagine that times ten when you are out and about traveling and discovering a new place. There’s a reason why certain people are around. They’re not always there to chat, but if the mood suits you, ask somebody how/why they came to be in that exact moment with you. It’s funny that you can share a moment with someone but not even know how/why that other person came to be there. Why don’t you do yourself a favor and find out? You may discover that you and unknown mystery person X have more in common than you think. If anything, it’s a good way to remind yourself that you still have a voice after you’ve spent a good amount of time in a shy silence. Random friends at Devil’s Pool. You guys were nice! 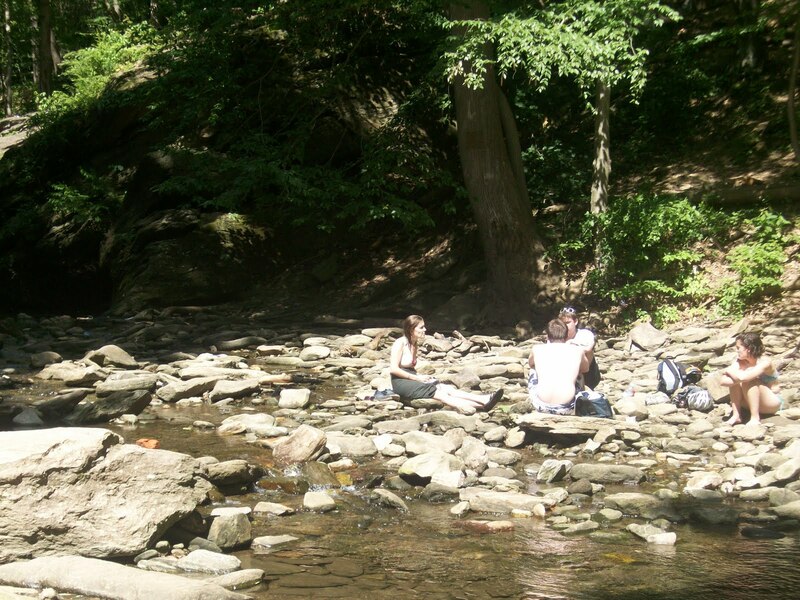 For instance, while at Devil’s Pool, I met up with a group of kids who said they had just traveled down to Pennsylvania after a Metal music fest in Maryland. Since a few of my friends are really into metal, we started talking metal bands, music, festivals…everything. They even invited me to stay and hang out longer with them and their dogs. Had I had more time, it could have been the start of a beautiful friendship. Instead, they remain just a memory, but it’s funny that we came together at the same spot at the same time. At the very least, talking to someone who you perceive to be a stranger will give you a story to tell. While you by no means have to befriend everyone everywhere you go, it’s courteous to acknowledge someone’s existence, especially if you are off the beaten track. It’s impossible to expect others to nod and wave at you in a big city, but when hiking or visiting a remote stretch of somewhere, a nice nod, “hello” or “how are you doing?” makes a world of difference. It can start a genuinely interesting conversation or it could merely an acknowledgment that “Hey, we’re kind of in this together, aren’t we?” It’s the human thing to do. You don’t want to be that stiff that stares at the ground, begging not to be talked to. Open up and discover the world you share with others. Chances are after talking to some of those scary strangers, you’ll discover that fear is the child of ignorance and that you owe yourself better than that.